Shitokai Scotland is one of the most successful clubs on the Scottish and British competition scene and are also making an impact on the International stage. We provide the Scotland National Team with the largest number of athletes from any one club at Cadet, Junior, U21 and Senior Level. 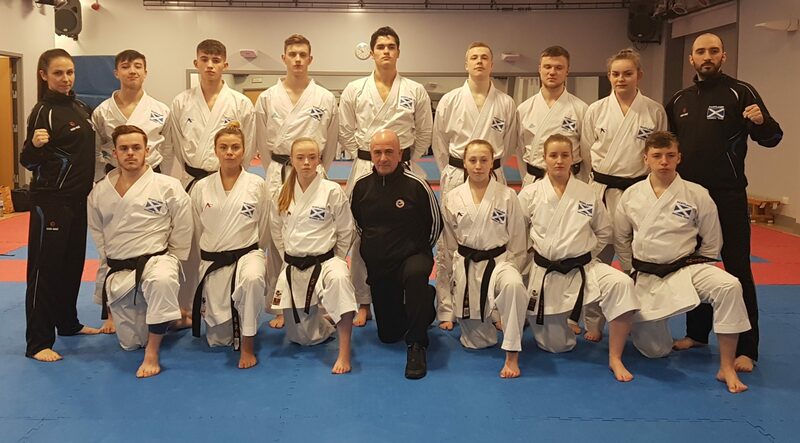 We are proud to present our Scotland National Team athletes and Coaches featured along with Shitokai Chief Instructor and Head of Association, Terry Connell (front row, centre). Back row (left to right) – Stephanie Connell (Coach), Alex Marshall, Louis Galasso, Johny Gilmour, Chris Scott, Dylan Rush, David McCreight, Niamh Junner, Martin Douiglas (Coach). Front row (left to right) – Jordan Szafranek, Amy Connell, Emma Ruthven, Amiee Pollard, Heather McIlraith and Matthew Chalk.